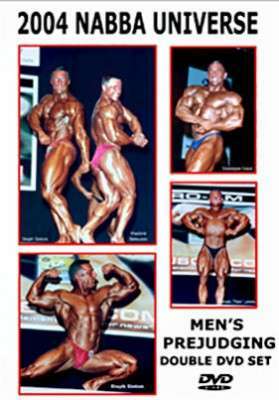 The 2004 NABBA Universe saw a record number of competitors. Accordingly this is the longest ever Men’s Prejudging video running for a massive 154 minutes. With the quality being so high, we have included posing routines of every one of the 98 competitors, plus all Round One lineups. You will also see every single competitor in at least one Round 3 set of comparisons. The Professionals were only judged at the Evening Show in the Pro-Am contest – see GMV-596 Men – The Show. Held in Kidderminster, the 2004 NABBA Universe saw a record number of competitors, making this is the longest ever Men’s Prejudging DVD. It runs for a massive 154 minutes. As the quality is so high, we have included the posing routines of every one of the 98 competitors, plus all Round One lineups. This is the FIRST TIME EVER that we have shown every posing routine from the PREJUDGING, thanks in part to advances in video technology. You will also see every single competitor in at least one Round 3 set of comparisons.